Eloquent, funny, serious, and sometimes tongue-in-cheek are just some adjectives I'd use to describe Canadian film director Norman Jewison's book. Name sound familiar? Seen "Cincinnati Kid", "In The Heat of The Night", "The Thomas Crown Affair", "Best Friends", "Moonstruck", "Jesus Christ Superstar", or "Fiddler on the Roof"? All directed by Mr. Jewison. All gems of movies, too. After a spell at directing for television, in the early 60s Mr. Jewison started his film directorship - and what a career it's been. Stars such as Al Pacino, Cher, Sir Michael Caine, Denzel Washington, Gregory Peck, Jane Fonda, Goldie Hawn, and Steve McQueen are among the many who have worked with this gentle genius. He comes across as a humble and respectful gentleman (maybe it's because he's Canadian) and not a tyrant as one might imagine. This is his delightful personal story of his working life, interspersed with snippets of his family life, and great insights and anecdotes about some of those with whom he's worked. His experience at being an outsider and his connection (conscious) with black people, and his concern, makes for an interesting read as well as a better understanding as to why he made some of the films he did. From the heart, I guess. He lives on a farm in Canada and remains a strong influence in the film world. 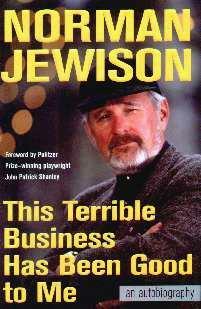 Mr. Jewison won the Thalberg Award at the 1999 Oscars. "Moonstruck" is one of my all-time favorite movies. Conclusion - A charming read, and pleasantly interesting.